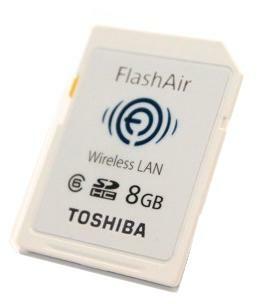 This summer Toshiba will launches its new Wi-Fi enabled SD card for cameras. These cards will let users share their photos immediately, at the time and place when their photos are taken. Up to 10 devices can share the miniature wireless network, that the SD card generates, to download photos from its memory. 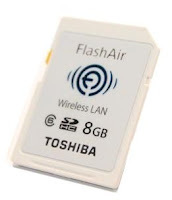 The 8GB card is currently available in Japan and sells for about 6,000 Japanese Yen (US $72), while a regular SD card sells for a fraction of that price. In the future, Wi-Fi enabled SD cards may be obsolete because digital camera makers are building Wi-Fi features directly into the hardware of the camera.